Work-life balance. The elusive word/idea/thing that we strive for. What does it mean to be “balanced” in work and life? Does it mean that we spend 8 hours working and 8 hours with family every day? Does it mean that we spend all our time working and then create some epic trip or event to balance out the other aspects of our life? Much like the authors of Personal Kanban, Jim Benson and Tonianne Marie Barry, I think this is a false separation. Professional life. Personal life. Social life. They are often treated as separate entities, but our lives and insights cannot be segregated. Work/life balance is a false dichotomy; compartmentalization is not sustainable. It forces life’s professional, personal, and social elements to vie for attention, bringing with them seemingly competing expectations and goals. It’s all life. Work is life. Family is life. Volunteering is life. We do tasks in each area. Accomplishment and recognition across all areas is what gives us a feeling that we’re achieving what we want to in life. Making progress in these areas of our life is what we want on our quest for significance. I like the idea of ‘counter-balance’ here, which comes from The ONE Thing. Papasan and Keller suggest that you go “short” at home and long on “work” tasks. That means, you spend some time focused on work, but it’s short, and you spend time at home and with those you love as well. You never let that get too far out of balance. Email, leave it. Calls others want to schedule because they think are it’s important can wait a month or two. You can go out of balance for a while here to focus on the one thing that will push your business forward. This is where Personal Kanban steps in. It’s intended to be a system that can manage work and personal items all in one. It’s ludicrous to assume that what we have to do outside of work will have zero impact on our output in the office. I sit here on a tough day thinking about this. In around 6 hours I’m heading to the vet to have our dog put down. She’s been my hiking companion for 12 years. We’ve been all over the mountains and camping. She’s been silly and annoying and sick and wonderfully comforting. Assuming that I could do a regular day of work today, or tomorrow is insane. But if I was at a traditional job, that would be the assumption. I’m lucky in that I work for myself and can decide to spend a few hours writing and then call it a day. I can decide to spend the afternoon on the couch loving my friend of 12 years. You need to recognize that work and life are inseparable as well. The sooner you do, the better you can plan your work. There are only two rules in personal kanban. Limit work in progress (WIP). So, only have two things at a time on your “DOING” list. Everything else is in some other list. We were visualizing work, limiting your work-in-progress, pushing decision-making to the last responsible moment, and continuously striving to improve. We learned that understanding our work is the key to controlling it. The key here is to understand your work. I’ve been feeling this lack for a while. Do I have a handle on how much time everything I do takes? Do I know exactly how many hours or units of output I have in a week? Without knowing these things, how can I plan for a work week that provides the maximum value on the things that matter? Do you what your real output is for a week? What will it take for you to know these things for your business? My guess is no; you don’t have an idea. When a new project comes along, you guess. You may say you estimate, but that’s more often a fancy way of trying to convince yourself that your guess is informed. 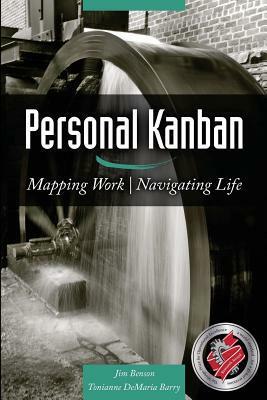 To help this, Personal Kanban introduces the idea of gauges. We don’t dare drive without watching the road or checking our gauges, but oddly enough we manage our work blindly all the time. We don’t visualize our tasks or rely on information radiators to alert us when our work might veer off track or require intervention. At best, we use deadlines to track our progress, even though deadlines are imposed, inflexible, and often don’t respect our current context. Based on assumptions about the future, deadlines fail to take into account actual, real-time information. Gauges substitute deadlines. Gauges visualize our work. Gauges mean we start tracking our time on tasks. This is why I know that most freelancers have no idea how much time a task takes, so many of them don’t track their time. There are six steps to Personal Kanban, and many of them you’ll be familiar with if you’ve been doing GTD or some other productivity system. This is your big list of everything you have on the go. Paper the walls with your sticky notes. Get it all out of your head. You’re going to realize that you’ve got way more on the go than you thought. It may take one big session, then a few small ones as you realize that you have more on your mind. Don’t worry about organization at this point, just do the work. This is your brain dump. All the things you could do. Not just work stuff, but personal stuff1. We keep this list around so that we have a handle on it. The thing is, we tend to fear what we don’t understand. If we don’t understand something, we can’t dispel it. If your backlog — the sum of our personal goals and expectations — is unknown, and if as humans we tend to fear the unknown, then we risk fearing our own success. If you’re a GTD person, you’ll recognize this idea. In GTD terms, you’ll waste your brain cycles on tasks because trying to remember them. Step four is about limiting your Work In Progress. Here I like the idea of the rule of two. No, not the Sith Lord rule of Master and Apprentice only, but the rule that you can only ever have two projects on the go at once. Too many things on the go mean that we leave things in a state of half-finished. That leads to brain power being spent on half-done projects. The book recommends you limit your WIP to three things, and then see what works for you. Four is fine; two is fine. I’m going to say, two only. If that’s two client projects fine. If that’s a client project and an internal project. Fine. The only other thing you can have on the outside of two projects is the little things like checking email. This is a hard one as you look at client services. Client services mean that people “push” tasks on to you. They have an issue with their site. They have a question for you. They push those tasks towards you and have an ideal date to get them done. In contrast, Personal Kanban is a pull-based system. You pull tasks into your DOING pile as you have the bandwidth to do them. Personal Kanban is a pull-based system. We pull work into DOING only when we have room to accommodate it. Pulling is a willful act. This is different from “pushing,” which is how we normally take on work. In a push system, people tend to tell you what to do and when to do it, regardless of whether you have capacity for it or if it is really the highest priority task at the time. I’m not sure I have an answer for this yet. My best guess for freelancers is that you have your two projects. You only pull another one when you have space open up. Until then, new clients wait. If that sounds scary in the finances department, you’re running a broken business so get it on track. You should look at Profit First as a way to get your business budget on track. Now, we get back to that done column. Instead of checking off your tasks and then they’re gone. You sit back and reflect on how much you got done. This also is a time when you look at your whole board. One thing that happens is tasks get stuck waiting for someone. Remember one of the rules is to visualize your work in progress. If you’re waiting for someone, then you need to reflect that with your board. Every time your work involves another person or something happens outside your immediate control, make sure it is reflected in your board. Going further in the book some new lists get added. They introduce the idea of the “Pen” which is a holding place for tasks that are part way done. Maybe you’re waiting for something, so it goes on that list. The rule with the holding pen is that you need to pull tasks from there first before you empty out any other items. They also introduce the idea of a “today” column. This is for the tasks that we want to get done today. Their warning is that we need to make sure the list isn’t so overloaded that we couldn’t do it. Michael Hyatt echoes this in The Best Year Ever when he talks about setting goals in the delusional zone. The zone that is so far outside our current possibility that we may as well be wishing on a magic genie to make the goals happen. We all fall into this sometimes. We build wish lists. Lists that anticipate everything going perfectly. This is where gauges come into play again. Make sure that your list for the day matches up with the gauges you have established. That’s the essence of the system. The rest of the book helps you work through what it might mean in practice to implement it. Benson and Barry introduce us to more of the issues we may have as we implement Personal Kanban. All too often we equate “free time” with “capacity.” We assume that if we don’t have an activity scheduled, we can fit in more work. Optimal highway travel is not achieved by putting as many cars as possible in the space that the road provides. That’s optimizing for capacity, and we call it rush hour. More people travel at better speeds on the highway by leaving room, that is optimizing for flow. We rush through one thing to get to the next, striving for quantity (productivity) when we know quality (effectiveness) will surely suffer. We need to optimize for flow, not capacity. Having 27 things checked off your list doesn’t mean you did anything worthwhile today. We should be striving for effectiveness, not just productivity. Productivity always seems to be getting more done. Effectiveness is getting less done overall, but more things that matter. We do these things that matter with full focus instead of focus split between a bunch of crap that brings little value to our business. With no objective measure, our emotions are the only metric we have to rely on. This is where our feet are sore, or we saw something awesome today, so we estimate that our daily steps are high. Our emotions do a poor job at specific gauges. When we check our Fitbit we find that we barely moved. This step measuring device is a much better real world gauge of our activity level. This is where we build our wishlists. We assume everything will go perfect and when it doesn’t, we’re baffled about missed deadlines. Our gut is good for telling us when we’re overloaded. Giving us that feeling that…whoa this is too much, but it’s terrible at telling us exactly how much we can get done in a day. The final big idea is that we should be striving for improvement. We’re not looking for perfection out of the gate. We’re only looking to do better than before. This is measuring the gap and not the gain. Measuring how far we’ve come, not how far we have to go to hit the ideal. As I learn to draw in the evenings, this is looking at how much better I’ve got in a month, not how good the teachers I’m learning from are. One gives me pride. The other shows me how bad I still am. Is this a good book? Yup. Should you read it? Yes, if you’re looking for new ideas to measure your week and get important work done. If you’re looking for a specific step-by-step setup process, then Personal Kanban may leave you feeling a bit put off. It’s great on the theory and provides some examples, but the authors feel that each system needs to be tailored to you. They stay light on prescription for where to start then because you must make it your own. If you’re looking for more prescription then take a look at Extreme Programming or watch for my upcoming look at Scrum. Personal Kanban gives you the theory of building a pull based kanban system. Light on practical application because they think that it's way to individual to dive in. Great place to start if you need a task management revamp.